Fudgy, cake-y, gooey, chocolate-y…are just some of the words we often use to describe one of America’s favorite desserts: Brownies! Who doesn’t love a good brownie? Well, I guess unless you are allergic or strangely opposed to chocolate. But, most people I know are definitely pro chocolate, including myself. As my readers have probably noticed by now, I like experimentation when it comes to cooking and eating. I even take risks while baking, which has never been my specialty. So, I recently decided to forgo my Ghiradelli brownie mix (which is amazing, by the way), and try something totally out of the box: Black bean brownies. You may be thinking, how could these possibly taste good? They sound utterly disgusting! But, believe it or not, you can’t even tell that the beans are even in the picture once the brownies are done. You can probably fool all of your friends and family! It’s actually kind of fun. The majority of my taste-testers said, “These are very fudgy and chocolate-y.” But not one person I surveyed could guess the secret ingredient or thought something was a little strange. And no one really cared too much once I revealed the truth, because there is still plenty of chocolate involved. And really, they’re just brownies! This recipe is from one of my favorite food bloggers, Chocolate Covered Katie, and really just goes to show that breaking away from the traditional can be sensational. Were your friends or family able guess the secret ingredient? Share with me on Facebook, Twitter, or Instagram @coneysandkale! 1/2 cup to 2/3 cup chocolate chips (I think I used way more and advise you to do the same)! 2. Combine all ingredients except for the choco chips in a food processor. Make sure you blend until very, very smooth! 3. Stir in the chips, and pour batter into a greased 8×8 in. pan. 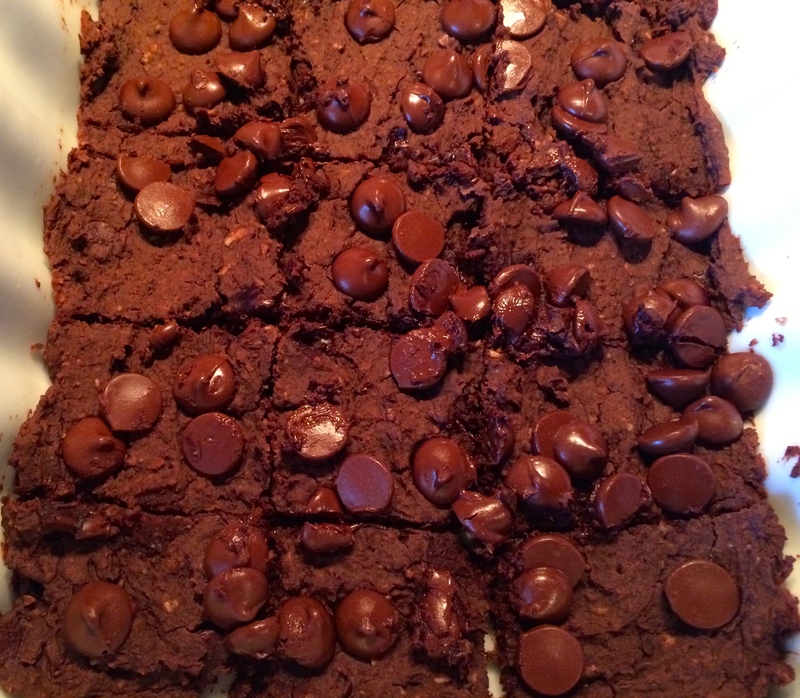 Sprinkle extra chocolate chips on top and bake for 15-18 minutes/do the toothpick test to make sure they are done. 4. Let the brownies cool for at least 10 min. before cutting. It’s the hardest part, ’cause you’re going to want to dig in asap! C&K Tip: These make a perfect sweet treat for Valentine’s Day! Yes, they were chocolatey rich and so satisfying!